Fien Meynendonckx is a Belgian author whose books include Oh My Dog! : Thierry Poncelet, The Good-The Bad: The 100 Greatest Heroes and Villains in the History of Film, and the soon to be published Losers and Idiots: A Tribute to Failure, and To Beard or Not to Beard: A Trendy Man’s Guide to Facial Flair. “Ms. 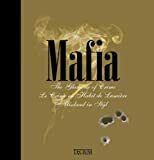 Meynendonckx’s book gives an international view of movie crime and its bloody, reality-based equivalent. Much of the focus is on crime in America and the Hollywood version of same. .